Girls Basketball Head Coach Carl Buggs leads a Zumba session of Poly students during Wednesday at lunch. 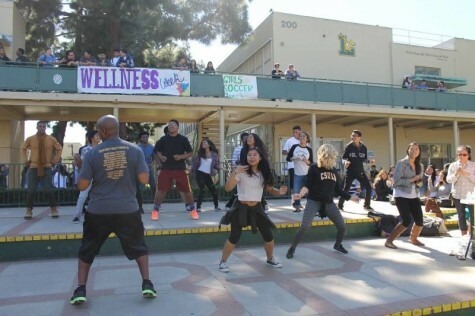 his year, Poly is hosting the second annual Wellness Week from Feb. 23 to 27. These few days help promote awareness for the physical, mental and emotional support of students on and off campus. All students are invited to participate in rallies each day during lunch. Music, performances and fun games are offered. Free workshops are also available to anyone interested; these take place in the Cafeteria Teachers’ Lounge after school. The week concludes with a Health Fair held during lunch on Friday, at which more than twenty clubs will offer free services and prizes to passerby. “We really wanted to do Wellness Week to be able to educate students on campus about their well-being,” said KGA advisor Ashley Uyeda. Wellness Week began when Khmer Girls in Action collaborated with the on-campus nonprofit HealthCorps last year. The events were met with a positive reaction from the school, so this year’s Wellness Week is being executed on a much larger scale. KGA began campaigning last year for a school-based health clinic, eventually getting the approval to establish a wellness clinic at the future Roosevelt Elementary school across the street. It was through a school-wide effort that the KGA, HealthCorps and the MAPS Academy were able to make this week happen. The special collaboration between these three groups has provided Poly and its students with much-needed support during times of crisis. “Wellness Week is there to provide students with resources on campus to help them live better lives. Well-being is important because kids are in a transitional period, where a lot of support is needed at that time,” said HealthCorps coordinator Evelyn Rwema. In addition to Wellness Week, the Care Center and Peer Counseling are services provided for students who need mental and emotional help. All in all, Wellness Week is a very effective way of engaging students to learn more about the opportunities available to them on campus. If there are any health initiatives students want to plan in the future, feel free to reach out to Evelyn Rwema in Room 520.